Journal of the Royal Anthropological Institute, 8: pp. 451-468. Royal Anthropological Institute of Great Britain and Ireland (2002). 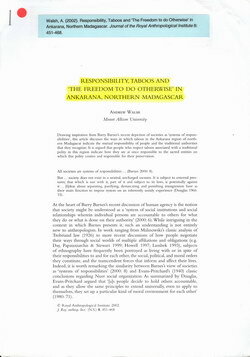 Drawing inspiration from Barry Barnes's recent depiction of societies as 'systems of responsibilities', this article discusses the ways in which taboos in the Ankarana region of northern Madagascar indicate the mutual responsibility of people and the traditional authorities that they recognize. 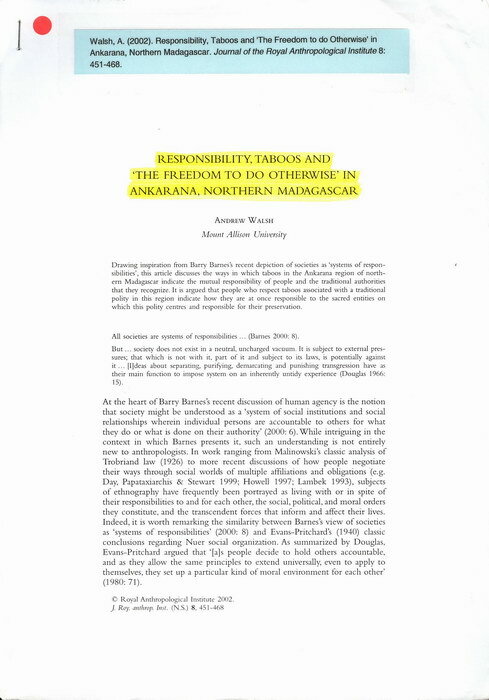 It is argued that people who respect taboos associated with a traditional polity in this region indicate how they are at once responsible to the sacred entities on which this polity centres and responsible for their preservation. The author is from Mount Allison. Good. Title is marked in fluorescent highlighter.